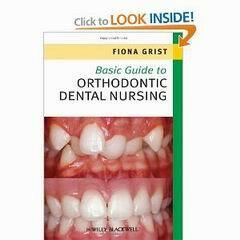 Basic Guide to Orthodontic Dental Nursing PDF Download Ebook. Fiona Grist offers complete introduction for those seeking to develop their knowledge and understanding of this core area of clinical practice. Written in a clear and accessible format, with color illustration throughout, the book is a guide for all dental nurses with an interest in orthodontics. It is designed to reflect sections of the syllabus of the Certificate in Orthodontic Dental Nursing. Chapters cover such key topics as tooth eruption patterns, removable and fixed appliances, de-bonding, and retention. There are also sections on care prior to treatment, including the requirements for a first appointment, and there is helpful guidance on maintaining motivation – particularly for young patients and their parents. Author introduces the tools and procedures for assisting an orthodontist chairside, and outlines what to prepare so that treatment can be undertaken as efficiently as possible. This book is all you need to know about assisting in orthodontic care delivery and is an invaluable learning tool and reference for all the orthodontic team. This book is clearly written for the British market; the patient information leaflets issued by the British Orthodontic Society are widely referred to, there is a chapter dedicated to ‘orthodontic therapists’ and the book refers to the General Dental Council of the United Kingdom and its regulatory framework for dental care professionals (dental technicians, nurses, and therapists).